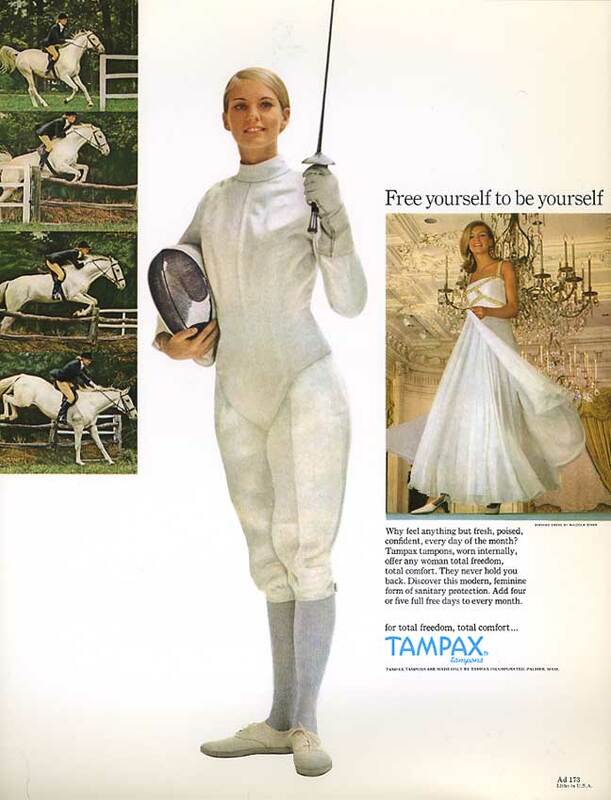 Tampax trots out horses and fencing and another evening gown in contrasting lowly menstruation with high social class activities. And look at the white - even the horse! The tiny type under the photo at right reads EVENING DRESS BY MALCOLM STARR. NEXT: Discussion - Folder front Folder center: left right Folder back - Glossy ADS: 1 2 3 4 5 6 7 || See the advertising folders for 1963 (with 6 ads) & 1964 (with 8 ads). || How to sell Kotex page for trade publications, probably early 1920s, U.S.A. - "Your Image is Your Fortune!," Modess sales-hints booklet for stores, 1967 (U.S.A.) - "Your 'Keys' to More Profits," Kotex brochure for retailers. 1960s. (U.S.A.) - First Tampax? & first tampon with applicator (1931-33? ): box, tampon, instructions, plus newspaper ad from 1934 - Tiffany bowl celebrating the 50th anniversary of Tampax - 1936: box, tampon, patent (with a short account of the invention of Tampax by Dr. Earle Haas, and of the first Tampax president, German immigrant Gertrude Tenderich) - Teachers' guides - Menstrual educational booklets for girls & parents. See the promotional folder for the next year, 1964.